Following last week’s post about ‘How-To’ shop for a dress, this week I am styling three different wedding looks that vary based on wedding-type. Typically a daytime event and often outdoors, casual weddings can be in venues such as a garden, beach or restaurant. Therefore, your attire should be fun and flirty to reflect the relaxed atmosphere. Just be careful not to be too casual – jeans or flip flops are never appropriate wedding attire. When selecting a shoe, be particularly mindful of the ground or flooring (for example, if the event is on sand or grass, you won’t want to wear heels that can sink into the earth. Likewise, decks can be tricky in heels too). Also, be aware of the weather forecast. If it is warm, you may need a hat or some shades. And, if it is windy, you won’t want to be clinging to your flowy skirt all afternoon. 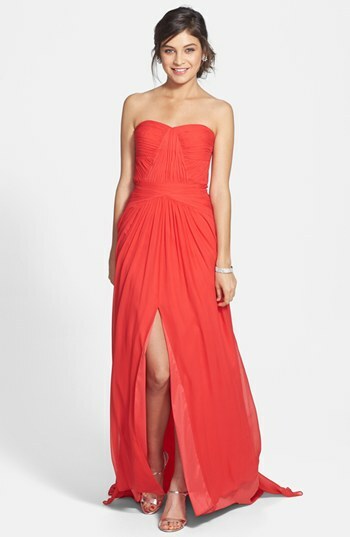 A semi-formal wedding begs for a fun party dress (think cocktail attire). Shorter-hemlines are appropriate and live-it-up with some “wow” factor – intricate details such as lace or beading and interesting accessories can make your outfit more festive. Just be sure that you keep things appropriate by not showing too much skin or wearing something too tight. If your outfit reads “club wear,” then it’s likely not appropriate. Conversely, you want to be dressy, so you shouldn’t wear something that you could otherwise wear to work. A formal wedding is generally hosted in a hotel, ballroom or banquet facility and, given the setting, usually requires a gown (a longer dress). Beading, sequins and lace can add extra sparkle and be sure to pour it on – how often do you get to dress up like this?! This is also a great opportunity to wear your hair-up and amplify your makeup to compliment your formal attire. Just be careful that your look doesn’t read too bridal, you don’t want to be mistaken for the wedding party or, worse yet, compete with the bride! I’m off to the Bay Area for a wedding this weekend – stay tuned for an outfit post to follow. Tell me…what are you wearing to weddings this summer? Also, please let me know if I can help with any of your styling questions. I’ve updated my “About” page with my contact information as well as provided links to my Instagram and Pinterest board. Please follow along for daily inspiration and a glimpse into my wardrobe, wish lists and general chaos! like yours require a large amount of work? Hi there. Thanks for the compliment. My only suggestion is to just start blogging, without concern for your posts being perfect or your site looking 100% amazing. Providing good continent and trying to post often and consistently will start to get you noticed. Best of luck! !